Drugs, poverty, and beaches – what do these three words have in common? They are stereotypes often used to describe Mexico that have sadly been upheld in the last decade or so. It is no secret that the school system in America has often failed to educate students on other countries, even if one of those countries is our southernmost border. I was born in Mexico City but moved to Houston after seven short years. Growing up in Texas, I often encountered ignorant people who were completely unaware of what life was like in my country of origin. Shortly after my family’s relocation, a girl in my class asked me if I rode a donkey to school in Mexico. Sounds like a joke, right? The look on this girl’s face showed no trace of humor, rather she portrayed curiosity. As I got older, I assumed my peers ignorance towards Mexico would significantly decrease as a result of education and experience. Unfortunately, that isn’t the case. To this day I receive comments like “you aren’t dark enough to be Mexican.” I have to explain the fact that Mexico was colonized by Spain, which is the reason for my light complexion. Another time, when I was seventeen, I argued with a friend and her mother about whether Mexico was part of North or Central America. (North America, for those who are still unsure.) So from 20 years of experience, I think it’s safe to say that Americans are still severely lacking in their education of foreign countries. Although school curriculums are primarily to blame , the media is also at fault for the negative misconceptions held about Mexico. Television shows such as Weeds and Breaking Bad have painted a picture of Mexico as being the sole birthplace of drugs and violence. Although the country suffers from both of these things due to the Drug Cartel, a criminal organization developed to promote and control drug trafficking operations, it is not Mexico’s identity. It is a country that is rich in history, art, and culture. Its people are constantly engulfed in the country’s beauty, and appreciating one another. Poverty alone does not define the total culture of Mexico, however, it is a huge problem. The country’s economic crisis is due to many problems of infrastructure and institutions – education, labor market efficiency, etc. Because of these factors, 46.2 percent of the population lives in poverty. Although I agree that this is a huge flaw, what Mexico lacks in money, it makes up in other ways. It is a country that is rich in history, art, and culture. Its people are constantly engulfed in the country’s beauty, and appreciating one another. Mexico’s customs include spending a lot of time with your immediate and extended families. Because of this, my father’s side of the family, all 28 members, try to arrange a yearly trip to reconnect, since half of us live in the United States and the other half in Mexico. This year, we travelled to San Miguel de Allende, just a three-hour car ride from Mexico City. The beautiful, colonial-era city is best known for its architecture, art scene and cultural festivals. The three days I spent in San Miguel were unlike anything I have ever experienced. While everyone merely strolled through the streets, chatting and often glaring at their phones, I was observing my surroundings with every step I took and photographing the beautiful art and architecture around me. At the center of the plaza, El Jardín, stands the breath-taking neo-Gothic church, Parroquia de San Miguel Arcángel. Every hour, a man rings the giant bell located at the top of the church in one of the pink towers that overlooks the city. The beautiful sound brings me peace, teleporting me into another time. At night, the main plaza is filled with people of all ages dancing and laughing to live music, as if there is not a care in the world. On the evening of December 30, I was lucky enough to catch a wedding on its way from the church to the reception. The whole party was walking down the street, the bride and groom behind giant, papier-mâché versions of themselves, followed by a large mariachi band and the attendees. Everyone was cheering and dancing, it was a truly unique and heart-warming sight. 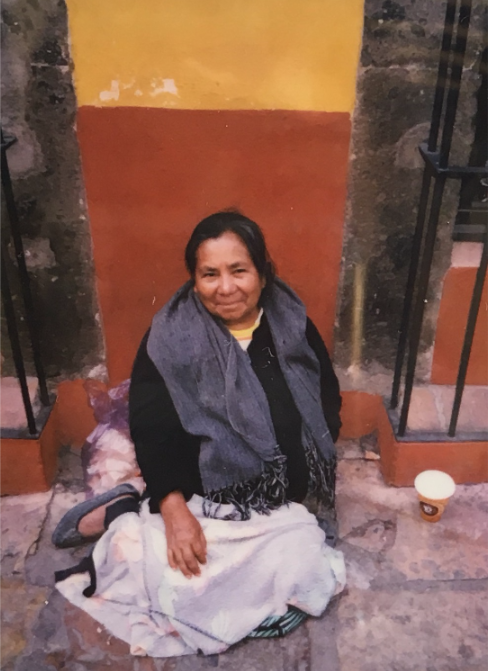 One day, I stopped to talk to an impoverished woman who was falling asleep sitting up on the street with a scarf over her head and a cup filled with loose change in her hand. When I walked up she quickly opened her eyes and tensed up, suddenly alert of her surroundings. I gave her 40 pesos and asked if I could take her picture. She removed the scarf from her head, fixed her hair and then smiled at my polaroid camera, asking to view her picture once the sun revealed the image. I chatted with her about her life. She told me her name is Paula, she is 56 years old and she has eleven children. Although she was begging for money on the street, her smile was kind and her face was full of life. Mexico is also seen in a positive way, but exclusively as a spring break destination by rich college students instead of the culturally prosperous place it truly is. It’s as if you were only known for your wild college years rather than as the CEO of a successful company you are today. Countries, just like people, have depth to them. Cities in Mexico vary in characteristics. Mexico City, for example, is a large city with modern areas containing beautiful skylines, while San Miguel de Allende has held on to its historical identity, which is what makes it so special. There aren’t many places in the world where a burger joint’s architecture is more beautiful than a 5-star hotel. I hope that my trip to Mexico will somewhat open up the eyes of those blinded by ignorance when it comes to this vibrant country. Drugs and poverty do not define Mexico, the same way other countries’ struggles do not define them. Places face tragedies, but places are not tragedies.